Just a month into the New Year and already I've found a must read book. 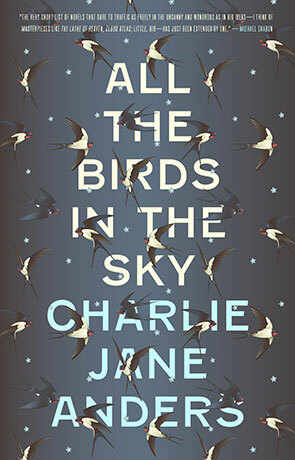 All the Birds in the Sky is the debut novel of Charlie Jane Anders who has been editor-in-chief of the popular SF site IO9.com for quite some time. All the Birds in the Sky follows the paths of two very different people who find each other as children. Patricia seems to have some unusual gifts, a knack with nature and powers others don't have. Laurence is an inventor, mad scientist and one of the talented few who have managed to build a two-second time machine. Both find friendship in the shared weirdness but eventually their lives take different paths and they lose touch with each other. Some time later as adults with careers they once again find each other. Laurence a genius engineer trying to save the world with somewhat of a celebrity status in San Francisco. Patricia graduated the secret academy for the magically gifted and works with fellow magicians to repair the earths increasing ailments. Both trying to make the world a better place but each from opposite ends. There is so much to like about All the Birds in the Sky, its got heaps of big ideas and examines the big far reaching questions such as the fate of the planet and the fate of humanity (related but not identical subjects) and more immediately relevant questions such as social acceptance, friendship and emerging artificial intelligence. Then there is the prose, it's easy to read, accessible and entirely irresistable — it draws you into this near future version of our planet that just happens to have people who can use magic and yet blended with this is a 21st century idea of near-future technology that is really only a small step from where we are now. The characters are credible, likeable and as real as it gets, Anders makes you really care about the lives of Patricia and Laurence and their relationship. It's very easy to fall down by mixing up high technology with magic and earth power and nature and things, many authors attempt this feat and get it wrong enough to make you shiver. Anders totally nails it though and there was no part of the story that didn't work. It's perfectly modern with a seriously impressive narrative flair and is decidedly post-millenial. It's got that easy reading feeling that could make you believe it's a Young Adult novel and perhaps it is, although I haven't seen it marketed as such. That is perhaps another insight that Anders provides — does a book become a Young Adult one purely based on marketing (some are for sure). All the Birds in the Sky is a wonderful, modern story that celebrates people's differences while also providing a running commentary on some of the problems people, society and our dear battered Earth face along with how the road to hell is indeed paved with the best intentions. Science fiction at it's finest, Charlie Jane Anders has just become an author to watch. Written on 8th February 2016 by Ant.